WARM SPRINGS, VA — The votes are in and the people have spoken. The Virginia Center for Architecture announces today that the Bath Houses at the Warm Springs Pools came in 33rd in a public poll to identify Virginia’s Favorite Architecture. The survey, which garnered nearly 30,000 votes, found that Virginians chose buildings that evoke powerful emotions and memories as their favorites. Universities and Thomas Jefferson claim most of the top 10, with an historic church and an iconic airport thrown into the mix. An exhibition titled Virginia’s Favorite Architecture opens on Thursday, April 10 at the Virginia Center for Architecture and highlights each of the 100 structures identified as Virginia’s most beloved pieces of architecture. The exhibition runs through Oct. 19. The Center is located in the Branch House at 2501 Monument Avenue in Richmond. 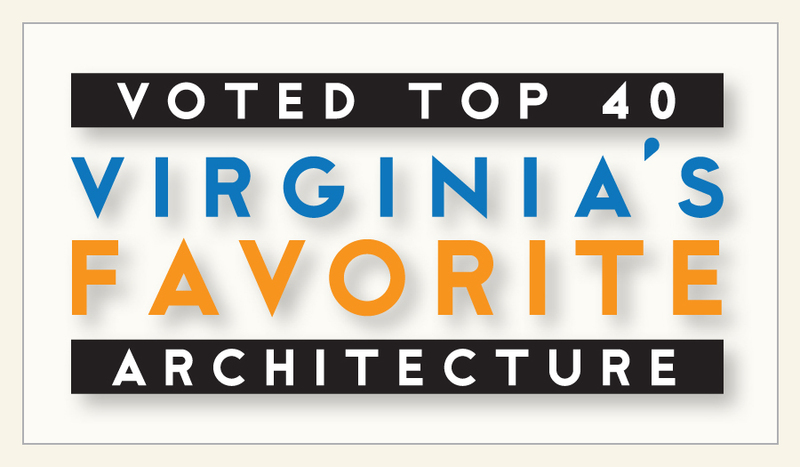 The top 100 structures identified as Virginia’s Favorite Architecture are a diverse mix, spanning a variety of architectural styles, types, and periods. They represent Virginia’s rich history and showcase the state’s many architectural treasures — both innovative and traditional. An exhibition titled Virginia’s Favorite Architecture opens on Thursday, April 10 at the Virginia Center for Architecture and highlights each of the 100 structures identified as Virginia’s most beloved pieces of architecture. It is on view at the Virginia Center for Architecture through Oct. 19, 2014. The exhibition was designed by Roberto Ventura with curatorial support from Lauren Bell and Julie Pence. Virginia’s Favorite Architecture premieres on Thursday, April 10, 2014 at the Virginia Center for Architecture with an Opening Reception from 4:30–7:30 p.m. The reception is free, but space is limited and reservations are recommended. Register online at architectureva.org or by phone to (804) 644-304, ext. 100. Virginia’s Favorite Architecture is on view through Oct. 19, 2014. Roberto L. Ventura has practiced and taught modern and sustainable design in Virginia and North Carolina for 15 years. A member of a number of local teams earning design awards from AIA Richmond and the James River Green Building Council, his work has also been exhibited nationally through the HOME House Project sponsored by the Southeastern Center for Contemporary Art. For the international light art exhibit InLight Richmond 2009, he collaborated with poet Joshua Poteat on the installation “for gabriel,” winning Best in Show. While maintaining his practice, roberto ventura design studio, Ventura is an Assistant Professor in the Department of Interior Design in the School of the Arts at Virginia Commonwealth University. He has also taught Interior Architecture at the University of North Carolina – Greensboro, and has lectured at the University of Oulu, in Oulu, Finland. Ventura holds a Master’s in Architecture from Miami University and a B.A. in Math and Physics from Albion College. He earned his LEED AP accreditation in 2008 and his NCIDQ certification in 2012. The Virginia’s Favorite Architecture exhibition is part of a year-long observance called Virginia Celebrates Architecture recognizing the 100th anniversary of the Virginia Society of the American Institute of Architects. Throughout the year, members of the American Institute of Architects in Virginia will join their neighbors and the Virginia Center for Architecture in community exercises intended to instill a greater appreciation for proper stewardship of the Commonwealth’s built and natural environment. The Virginia Center for Architecture is located in the Branch House at 2501 Monument Avenue in Richmond, Virginia’s historic Fan District. The Center is dedicated to developing the understanding of the power and importance of architecture through programs, exhibitions, and its stewardship of an historic landmark. The Center is open to the public Tuesday through Friday from 10 a.m. to 5 p.m.; Saturday and Sunday from 1 to 5 p.m. Learn more at www.architectureva.org. The Virginia Society of the American Institute of Architects is a professional association representing nearly 2,500 members. Founded by 5 architects in 1914, the Virginia Society AIA has represented the professional interests of architects and allied professionals in the Commonwealth of Virginia for 100 years. For more information, contact the Virginia Society at (804) 644-3041 or visit www.aiava.org.